The conservation and sustainable use of biodiversity are issues that have been high on the policy agenda since the first Earth Summit in Rio in 1992. As part of efforts to implement in situ conservation, a methodology referred to as community biodiversity management (CBM) has been developed by those engaged in this arena. CBM contributes to the empowerment of farming communities to manage their biological resources and make informed decisions on the conservation and use of agrobiodiversity. This book is the first to set out a clear overview of CBM as a methodology for meeting socio-environmental changes. CBM is shown to be a key strategy that promotes community resilience, and contributes to the conservation of plant genetic resources. The authors present the underlying concepts and theories of CBM as well as its methodology and practices, and introduce case studies primarily from Brazil, Ethiopia, France, India, and Nepal. 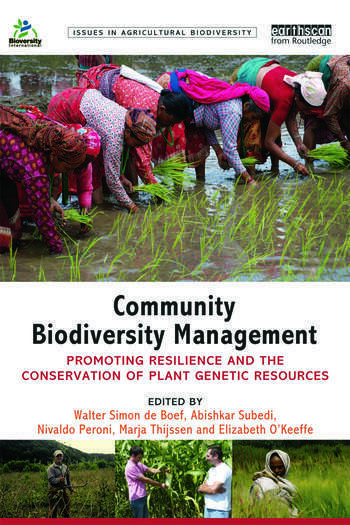 Contributors include farmers, leaders of farmers’ organizations, professionals from conservation and development organizations, students and scientists. The book offers inspiration to all those involved in the conservation and use of agrobiodiversity within livelihood development and presents ideas for the implementation of farmers’ rights. The wide collection of experiences illustrates the efforts made by communities throughout the world to cope with change while using diversity and engaging in learning processes. It links these grassroots efforts with debates in policy arenas as a means to respond to the unpredictable changes, such as climate change, that communities face in sustaining their livelihoods. 6.2 Farmers’ rights in times of change: illusion or reality? Walter Simon de Boef is Visiting Professor at the Federal University of Santa Catarina (UFSC), Brazil, and Associate Consultant at the Centre for Development Innovation (CDI) of Wageningen University and Research Centre (Wageningen UR), the Netherlands. Abishkar Subedi worked at Local Initiatives for Biodiversity, Research and Development (LI-BIRD), Nepal, until 2012 when he assumed the role of Agrobiodiversity and Seed Sector Development Specialist at the Centre for Development Innovation (CDI) of Wageningen UR, the Netherlands. Nivaldo Peroni is Professor at UFSC, Brazil. Marja Thijssen is Agrobiodiversity and Seed Sector Development Specialist at the Centre for Development Innovation (CDI) of Wageningen UR, the Netherlands. Elizabeth O’Keeffe is a freelance copy-editor based in Brazil.